Meaney grew up in London and Slough, England. He has been studying martial arts since childhood and has a black belt in shotokan karate. Meaney originally studied at Birmingham University and holds a combined degree in Physics and Computer Science from the Open University. He has done postgraduate work at Oxford University and is a part time IT consultant. 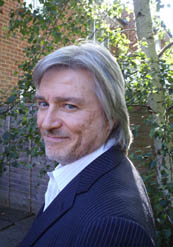 John Meaney is currently considered a "single author." If one or more works are by a distinct, homonymous authors, go ahead and split the author. John Meaney is composed of 3 names. You can examine and separate out names.